Throwing a Halloween costume party? Make sure that you pick up awards for those who put some serious time into their costumes. The Best Costume 3rd Place Halloween Ribbon is a great way to reward someone who obviously thought about what he or she was going to wear. 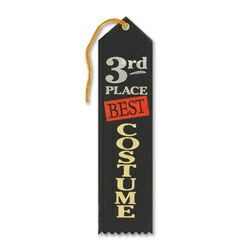 The ribbons are black with silver, red, and gold metallic lettering that reads "3rd Place Best Costume". These ribbons are sure to please any recipient even though they may not have come in first place. Make sure to also check out the 1st Place and 2nd Place Best Costume Ribbons.